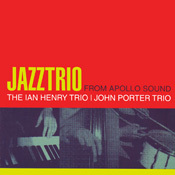 This CD features two LP''s - Perspectives by The Ian Henry Trio and Jazz in Landscape by The John Porter Trio. Born in Dublin, Ian Henry''s early musical studies were with his mother, a locally renowned singer, pianist and teacher. He later studied at the Read School of Music. By the age of 17, he was being featured regularly on radio and in concert as a pianist, composer and presenter of programmes. His quintet was the first band to appear on Irish Television (apart from the obligatory Ceilidh band)... The album was recorded at CTS studios (London) in 1975, and features Ian Henry on piano, Daryl Runswick on bass and Robin Jones on drums. John Porter was born in 1941 and (according to his mother), started playing the piano immediately. He was classically trained and finished his studies at the Royal School of Music. He became interested in jazz in his early teens and cites Art Tatum, Bud Powell and Bill Evens as his first influences. He has always maintained strong links with Jazz although he has worked in diverse areas including film scoring, jingle writing and West End musical productions. He spent a few years in the US during the 70''s before settling in Spain, where he is still playing regular Jazz gigs in Barcelona and Madrid. Recorded in the 70Â¹s, the twenty original compositions reflect the timeless nature of this music and feature strong melodies and themes, interspersed with beautiful, breathtaking improvisation and musicianship.